The year AD902 – as recorded in authenticated Irish Chronicles - marked the expulsion of Vikings from Ireland and their subsequent arrival and settlement of Wirral, a small peninsula between Wales and Liverpool, by largely Norsemen (originating from Norway). 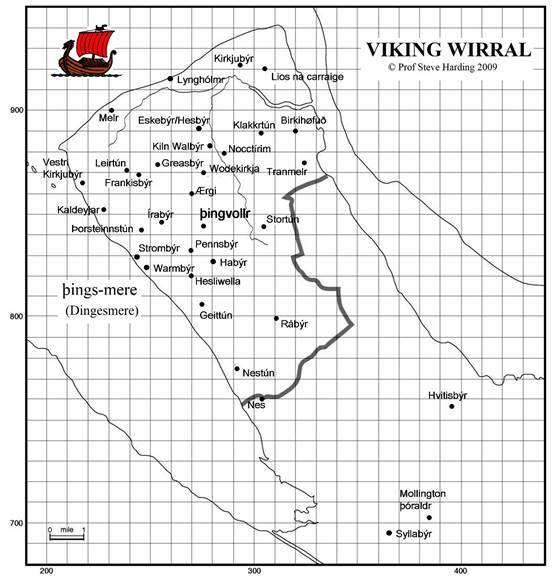 The Wirral Vikings, initially led by the Norwegian Viking INGIMUND, would have landed in their boats along the north Wirral coastline probably between what is now the lighthouse at Lingham (Old Norse lang-holmr), Hoylake/Meols (Melr), West Kirby (Kirkjubýr) and Thurstaston (Thorsteinn’s tún). They spread throughout the peninsula as far as south Chester and across the Mersey to populate South West and West Lancashire. And at their “Things” at Thingwall in Wirral and at another Thingwall in South West Lancashire they would have met regularly to discuss law and policy. We’ve put together here a collection of links to books, publications, newspaper articles and radio/TV links. Because of copyright restrictions etc. we have not been able to include all that we would have hoped for, but let's explore! Wirral and its Viking Heritage (Paul Cavill, Stephen Harding and Judith Jesch, 2000), paperback. Amazon link (UK) and Amazon.com. Viking Norway (Torgrim Titlestad, 2008), hardback, 405 pages, Saga Bok (Stavanger). Order from Bokkilden. Contains an Appendix: Norway’s “colony” of Wirral, Liverpool. The Battle of Brunanburh. A Casebook (edited by Michael Livingston, May, 2011), Exeter University Press. Amazon link (UK) and Amazon.com. Vikingblod - spor av vikinger i Nordvest-England - (Steve Harding & Stig Vaagan, Genesis Forlag, Oslo, December 2011) hardback, 314 pages. Bookis, Bestselger … og Bokelskere. Stability of Complex Carbohydrate Structures. Biofuels, Foods, Vaccines and Shipwrecks (edited by Stephen Harding, January 2013), Royal Society of Chemistry (based on a Meeting held at the RSC, Burlington House, London, September 2011). Leading experts exchange ideas and consider the stability and degradation (mechanisms and measurement) of carbohydrate structures in areas as diverse as food, biopharmaceuticals, vaccines, biofuels and preservation of Viking boats from microbial decay. In Search of Vikings (book about the interdisciplinary nature of Viking Research – Science, Archaeology and History all coming together - edited by S. Harding, D. Griffiths and E. Royles) – December 31, 2014. VIKING MERSEY: Scandinavian Wirral, West Lancashire and Chester. (Stephen Harding, 2002), paperback, 240 pages, Countyvise Ltd. Amazon link (UK). VIKING DNA. The Wirral and West Lancashire Project (Steve Harding, Mark Jobling and Turi King, Foreword by Michael Wood. CRC Press, December 2010), paperback, colour 166 pages. Amazon.co.uk … and Amazon.com. Viking Tranmere (Steve Harding, Countyvise, in conjunction with Tranmere Rovers in the Community, July 2014), paperback (colour), 74 pages. Amazon link and Tranmere Club shop. Ingimund’s Saga: Viking Wirral. 3rd Edition. (Stephen Harding, with Foreword by – and Tribute to – Magnus Magnusson). October, 2016, paperback, 250 pages. Chester University Press. Shopfront. 1. North-West Mercia AD871-924. Article by F.T. Wainwright, originally published in the Transactions of the Historic Society of Lancashire & Cheshire in 1942 and edited version reprinted in Wirral and its Viking Heritage, ed. P. Cavill, S. Harding & J. Jesch, 2000, pages 19-42. 2. Ingimund’s Invasion. Article by F.T. Wainwright, originally published in the English Historical Review in 1948 and edited version reprinted in Wirral and its Viking Heritage, ed. P. Cavill, S. Harding & J. Jesch, 2000, pages 43-59. 3. The Background of Brunanburh. Article by John McNeal Dodgson, originally published in the Saga Book of the Viking Society in 1957 and reprinted in Wirral and its Viking Heritage, ed. P. Cavill, S. Harding & J. Jesch, 2000, pages 60-69. 4. Early monuments of West Kirby. Article by W.G. Collingwood. Originally published in John Brownbill ed., West Kirby and Hilbre. A Parochial History, 1928 and reprinted in Wirral and its Viking Heritage, ed. P. Cavill, S. Harding & J. Jesch, 2000, pages 84-97. 5. Wirral Field Names. Article by F.T. Wainwright, originally published in Antiquity in 1943 and edited version reprinted in Wirral and its Viking Heritage, ed. P. Cavill, S. Harding & J. Jesch, 2000, pages 98-99. 6. Pre-Norman crosses of West Cheshire and the Norse settlements around the Irish Sea. Article by J.D. Bu’Lock, originally published in Transactions of the Lancashire and Cheshire Antiquarian Society in 1958 and in Wirral and its Viking Heritage, ed. P. Cavill, S. Harding & J. Jesch, 2000, pages 70-83. 7. Sir Gawain and the Green Knight and the Stanley family of Stanley, Storeton and Hooton. Review of English Studies, volume 30, pages 308-316 (1979). Article by Edward Wilson. The 14th century poem is interesting from a Wirral perspective in that some of the (fictitious) action takes place in Wirral, the poem contains a significant proportion of Norse dialect words and a number of scholars such as Edward Wilson, Gervase Mathew and Andrew Breeze have associated the unknown poet with Sir John Stanley of Storeton Hall, Knight of the Garter. 8. Scandinavian Wirral. Article by Judith Jesch. From Wirral and its Viking Heritage, ed. P. Cavill, S. Harding & J. Jesch, 2000, pages 1-10. 9. From Scandinavia to the Wirral. Article by Judith Jesch, with appendix by Simon Bean a silver ingot discovered in 1995 at Ness. From Wirral and its Viking Heritage, ed. P. Cavill, S. Harding & J. Jesch, 2000, pages 11-18. 10. The Vikings and Victorian Merseyside. Article by Andrew Wawn. From Wirral and its Viking Heritage, ed. P. Cavill, S. Harding & J. Jesch, 2000, pages 108-124. 11. Locations and Legends. Article by Steve Harding on the location of names and features in Wirral, mapping the distribution of some Norse-derived names, and looks at some tenacious Victorian legends. From Wirral and its Viking Heritage, ed. P. Cavill, S. Harding & J. Jesch, 2000, pages 108-124. 12. Battle of Brunanburh: extract from book by Paul Cavill – Vikings: Fear and Faith in Anglo-Saxon England, Harper Collins Publishers, London & Glasgow, 2001, pages 97-111. See also The Context of Brunanburh. Chapter by N.J. Higham in Names, Places, People. An Onomastic Miscellany in Memory of John McNeal Dodgson (ed. A.R. Rumble and A.D. Mills), Paul Watkins, Stamford, 1997, pages 144-156. 13. Viking Settlement in the Wirral. Journal of the Chester Archaeological Society, new series vol 78, 2003, pages 107-117. Article by Stephen Matthews suggesting Ingimund's arrival was part of a deal with Queen Aethelflaed. 14. Scandinavian Settlement in West Cheshire - Stretching the Boundaries. Cheshire History, no. 43, pages 28-40 (2003/4). Article by Dan Robinson of the Grosvenor Museum, Chester: it includes a description of the Shocklach "Sleipnir" Horse. 15. Revisiting Dingesmere. Journal of the English Place Name Society, October 2004, volume 36, pages 25-38. Article by Paul Cavill, Stephen Harding and Judith Jesch suggesting a solution to a mystery concerning the Battle of Brunanburh: Dingesmere = Thing’s mere or marr. 16. The Wirral Carrs and Holms. Journal of the English Place Name Society, December 2007 volume 39, pages 45-57. Article by Steve Harding on the distribution of the carrs (ON kjarr) and holms (ON holmr) in Wirral - old Norse names associated with marshland - and their significance in terms of dialect (and in relation to the total absence of corresponding English names for the same features) - and possible relevance to the Battle of Brunanburh. 17. The Neston cross: an exercise in community engagement. Abstract by Roger White, Steve Harding and Martin Cooper in Vikings in the 21st century (J. Jesch, C. Lee, J. Carroll and C. Callow, eds). University of Birmingham 17-18 December, 2007. Use of the latest scanning laser technologies to help construct a replica of a remarkable piece. 18. The site of the battle of Brunanburh: manuscripts and maps, grammar and geography. Article by Paul Cavill in A Commodity of Good Names. Essays in Honour of Margaret Gelling (edited by O.J. Padek and D.N. Parsons), Shaun Tyas, Donington UK, pages 303-319, 2008. 19. Excavating past population structures by surname-based sampling: the genetic legacy of the Vikings in northwest England. Molecular Biology and Evolution, February 2008 volume 25, pages 301-309. Article by Georgina Bowden, Patricia Balaresque, Turi King, Ziff Hansen, Giles Pergl-Wilson, Emma Hurley, Stephen Roberts, Patrick Waite, Judith Jesch, Abigail Jones, Mark Thomas, Stephen Harding and Mark Jobling. 20. Wirral: folklore and locations: Chapter by Steve Harding in The Battle of Brunanburh (ed. Michael Livingston), Exeter University Press, UK, pages 351-364, 2011. 21. **NEW** Vikings in the Wirral. From Tranmere Rovers to the Royal Palace. The Pembrokian, July 2012 volume 36 page 7. Interdisciplinary Approaches to the Scandinavian Heritage of North-West England: Chapter by David Griffiths and Steve Harding in In Search of Vikings Interdisciplinary Approaches to the Scandinavian Heritage of North-West England (edited by S.E. Harding, D. Griffiths and E. Royles) CRC Press (Boca Raton, Florida), pages 1-32, 2014. Gamul Terrace and the Viking connection. Journal of the Chester Archaeological Society (JCAS) 2016, volume 86 (new series), pages 97–108. Article by Stephen Harding. BBC Radio Lancashire, 8/3/02 Patrick Waite talks about the forthcoming genetic survey of Wirral and W. Lancs. BBC Radio Merseyside, 1/5/02 Lucinda Smith describes the celebration of 1100 years of Norse Wirral. BBC Radio Merseyside, 1st broadcast 28/5/02 Where's Wirral? - BBC Sense of Place series, 30 min. Roger Phillips interviews Lorraine Rogers, Ben Harrison, Helen Renner, Steve Harding, and Scirard Lancelyn-Green. Brief excerpt. BBC Radio Lancashire, 5/5/02 Patrick Waite and Wigan MP Ron Rigby talk further about the forthcoming genetic survey of Wirral and W. Lancs. BBC Radio Lancashire, 14/11/02 Alison Brown covers the DNA Sampling session at Ormskirk the previous day. BBC Radio 4, Nature Series, 18/10/04 One of the Vikings favorite dishes was lobster. Lionel Kelleway talks to experts about a fascinating molecule that comes from the shell of this creature. BBC Radio 4, Today Programme, 20th December 2004, Review of Today's Papers - Battle of Brunanburh. BBC News at One. 20th December 2004 (3 min). Report following Steve’s initial suggestion of the identification of Dingesmere in the Battle of Brunanburh as Things-mere. The research paper, Revisiting Dingesmere: Journal of the English Place Name Society, October 2004, volume 36, pages 25-38. BBC Radio 4, 6pm News, 20th December 2004, Mark Simpson Reports on the Battle of Brunanburh. BBC North West Tonight, 20th December 2004, News Item by Abbie Jones on the Battle of Brunanburh. BBC Radio Merseyside, Roger Phillips Show, 31st December 2004 (5 min) Report by Laura Fynn on Dingesmere and the Battle of Brunanburh. BBC Lancashire Telling Lives Series, January 2005 (2 min) "My Grandad Said": short film by Gladys Armstrong about the origins of the Rimmers. BBC Radio Merseyside, Breakfast Show, 25th January 2005 (6 min) Wirral Head Ranger Martyn Jamieson and Steve Harding talking about "Dingesmere" - the "Things mere" on the Dee estuary. ITV1 Granada (North West England): LOST TREASURES, Series 1, Episode 4, Part 1 (11min) before the break and Part 2 (11min) after the break. VIKINGS. Mark Olly and Stephen Harding go in search of Viking Treasures in Lancashire, Isle of Man and Wirral. Thursday 1st September 2005, 7.30pm. BBC Radio Merseyside, Linda McDermott Show, 13th December 2006 (4min). 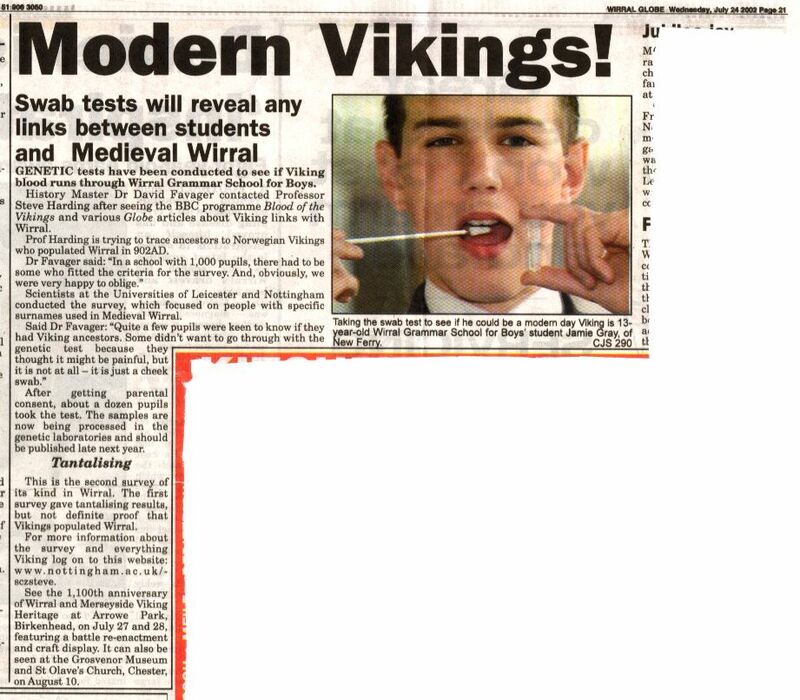 Report on new Web resource “Vikings in Wirral” for Wirral Schools (Key Stage 2/3). BBC link. BBC Radio Merseyside, 8th January 2007 (5min). Steve Harding pays tribute to Magnus Magnusson. ITV1 Granada, Sunday April 29th 2007: LOST TREASURES, Series 2, Episode 1: mystery over old cliinker boat buried beneath a pub at Meols: Mark and Steve explore. Download high resolution avi version. BBC News24. 10th September 2007 (4min) News item on Ground Penetrating Radar studies on an old boat buried under a pub – and a hypothesis of what it might be. ITV1 Granada, 13th September 2007 (3.5min). Reporter Andy Bonner visits the Railway Inn, Meols and meets the team behind the Ground Penetrating Radar studies on the old boat underneath the pub. BBC Radio Merseyside, 26th November 2007 (4 min). Tony Snell Breakfast Show. Looking forward to the Viking Genetics event at the David Lloyd Leisure Centre, Knowsley the following evening. NRK Radio, 27th November 2007 (6 min). Norgesglasset. Prof. Torgrim Titlestad (University of Stavanger) reviews the publication of the Viking Genetics paper in Molecular Biology and Evolution. Introduction, Notes, Elink to Norgesglasset. BBC Radio Merseyside, 28th November 2007 (3 min). Tony Snell Breakfast Show. Looking back at the Viking Genetics event. BBC North West Tonight, Evening News 28th November 2007 (3.5min). News item by Andy Gill reflecting on the publication of the Viking Genetics paper in Molecular Biology and Evolution. BBC Radio 4: Thingwall, DNA and the Vikings in Wirral, 20th May 2008 (8min). And you can read about it here. ITV1 Granada, 20th July 2008 6pm (22 min) LOST TREASURES (Series 3, Episode 5): VIKINGS 3. Mark and Steve go in chase of Vikings again…. and also this clip from Lost Treasures Episode 7: Anglesey, broadcast on 3rd August 2008. CityTalk105.9 (Liverpool), 26th July 2008 8.15am (6 min). Saturday Breakfast Show: Simon O’Brien talks with Steve Harding about the days Olsok08 Viking Churches Heritage Walk between Neston and St. Olave’s Chester. Sunday August 31st 2008: ITV1 Granada, 5.30pm. FRED’S FAMILY WALKS, Episode 3: Fred takes us for a walk in Little Scandinavia. ITV Weatherman Fred Talbot walks through a corner of Viking Wirral with Steve Harding. Low resolution version. BBC2, Saturday 3rd January 2009, 8pm-9pm GMT. Neil Oliver gives the Scottish perspective on the Battle of Brunanburh - and emphasizes its importance for the UK. “The Last of the Free: At the dawn of the first millennia there was no Scotland or England. In the first episode of this landmark series, Neil Oliver reveals the mystery of how the Gaelic Scottish Kingdom - Alba - was born, and why its role in one of the greatest battles ever fought on British soil defined the shape of Britain into the modern era “. Repeat of broadcast on BBC1 Scotland in November 2008. Direct link to the piece. WCR Radio (W. Miidlands), Monday 9th November 2009, 7pm, Philip Solomon show. Philip chats with Steve Harding about the Vikings and DNA tests. BBC Radio Lancashire, Saturday 30th May 2010, 1pm. (8 minutes). Maria Felix-Vas talks to Steve about the DNA testing in North Lancashire and the earlier results for Wirral-West Lancs. Part of the Viking Day at Lancaster Maritime Museum. BBC Radio Lancashire, Saturday 18th December 2010, 8.20am. (6 minutes). John Gilmore talks to Steve about the new book “Viking DNA: The Wirral and West Lancashire Project”. BBC Radio Lancashire & BBC Radio Manchester, Tuesday 18th January 2011, 10.25pm. (35 minutes). John Barnes talks to David Johnson (Tarleton) and David Swindlehurst (Preston) about DNA and their Viking ancestry. BBC Radio Lancashire, Thursday 10th February 2011, 2pm. (35 minutes) John Gilmore and the new Viking DNA book by Steve, Mark and Turi. BBC Radio Merseyside, Sunday 29th May 2011 5pm & Wednesday 2nd June 9pm (30 minutes). Roger Phillips asks Steve Harding how he got involved with the Vikings – he also talks about the Harald Fairhair project. Channel 4, Wednesday 26th October 2011 (1 minute). Opening sequence from Come Dine with me “Welcome to Wirral, home of Tranmere Rovers, the only football league team with a Viking name”. BBC Radio Merseyside 18th November 2011 (3 minutes). Steve tries to persuade RM’s Roger Phillips to become a Tranmere fan as part of BBC’s Children in Need, live on air, Radio Merseyside. NRK Østlandet, 9th December 2011 (20 minutes). Interview with Stig Vaagan (in Norwegian/ i norsk) about the new book Vikingblod. BBC Radio Merseyside 27th January 2012, 11.58am (2 minutes). Roger Phillips on Steve’s award from Norway. BBC Radio Nottingham 27th January 2012, 5.55pm (5 minutes). Simon Hoborn also talks to Steve about his award from Norway. BBC Radio Lancashire 30th January 2012, 8.25am (5 minutes). Graham Liver talks to Steve about the Vikings in Lancashire – are they still here today? BBC Radio Merseyside 14th March 2012, 6.50pm (7 minutes). Lee Bennion (Drivetime) reports. BBC Radio Cumbria, 15th March 2012, 7.25am (2.5 minutes). Ian Timms reports. BBC2, Friday 1st June 2012. 9-10pm. The Great British Story. Part 2: The Vikings. Presented by Michael Wood: see this excerpt (12 mins). ITV1 Granada Reports, Friday 15th June 2012, 8pm. News item by Andy Bonner on the unveiling of the new Thingwall signposts in Wirral. ITV1 Granada Reports, Monday 10th, Tuesday 11th, Wednesday 12th June 2013. Series of reports by Andy Bonner about the visit of North West’s Viking Navy to Norway and the “Taming of the Draken Harald Fairhair”. ITV1 Central News, Tuesday 11th, Wednesday 12th, Thursday 13th June 2013. Series of reports by Andy Bonner about the visit of East Midlands ‘Danelaw’ Viking Navy recruits to Norway and the “Taming of the Draken Harald Fairhair”. BBC Radio Nottingham, Friday 21st June 2013 (5 minutes) Andy Whittaker talks to Steve Harding and Beverley Rayner about rowing the Viking ship in Norway. BBC Radio Merseyside, Wednesday 23rd October 2013 (2 minutes) Famous BBC Presenter David Dimbleby being interviewed by Simon Hoban prior to BBC’s “Question Time”. The Dimblebys are Tranmere Supporters! BBC Radio 4: The Great War - the Battle of Brunanburh, Tuesday 31st December 2013, 3pm (13 minutes) BBC Presenter Michael Wood and Scientist Prof Steve Harding discuss the possible location of this lost Battle site. In case of difficulty click here . BBC Radio Merseyside, Friday 18th July 2014. Draken Harald Hårfagre visit – the crippled vessel arrives in Wallasey for repair. BBC Radio Merseyside, Monday 28th July 2014. Start of this year’s 2-day St. Olav Wirral Viking Heritage Walk & Pilgrimage. BBC Radio Merseyside, Friday 27th March 2015. Paul Salter chats with Tranmere fan Steve Harding (3 min) about the battle to maintaining the only football team with a Norwegian Viking name in the football league. Radio Clatterbridge 1386am (Hospital Radio), Friday 4th March 2016. Viking Sagas Return to Wirral (16min). Andy Bonner chats with Steve Harding about the new In Search of Vikings book. As per usual the chat soon degenerates into football! BBC Radio Northampton, Tuesday 12 December 2017, Tuesday 12 December 2017. Carson Wishart Show. Steve Harding on Mike Creeth & the 70th anniversary of the discovery of H-bonds in DNA & Creeth’s 1947 for the model of DNA structure. BBC Radio Merseyside, Thursday 29 March 2018. Sean Styles and Steve Harding visit the Railway Inn, Meols. BBC Radio Lancashire, Tuesday 22 March 2018. John Gillmore talks to Paul Sherman (NW Heritage) and Steve Harding about the Viking Exhibition at Southport and DNA. BBC Radio Merseyside, Thursday 31st May 2018. Sean and Steve visit Brackenwood Golf course and talk about a battle where Vikings fought on both sides. BBC Radio Merseyside, Thursday 28th June 2018. Sean and Steve at Tranmere Rovers talking about ‘Sporty Vikings’. BBC Radio Merseyside, Thursday 26th July 2018. Sean and Steve in the studio discuss the St. Olav’s Day Viking Heritage walk taking place on Sunday 29th from the Viking churches of St. Bridgets West Kirby to St. Olave’s Chester. 1. The Great Stone of Thor (Notes and Queries, 5th Series 8, Nov 1877, pages 364-365) and 6th Series 3, Jan 1881 pages 30-31). Two articles by Sir James Picton pondering the origins of a large outcrop of red sandstone at Thurstaston. Picton argues the name Thurstaston derives from Thors stone whereas later research shows it derives from Thorsteinn’s farmstead – Old Norse, but nothing to do with what we now call Thor’s stone. 2. Meols (article by David Griffiths) British Archaeology, Issue 62, December 2001, p8. 5. 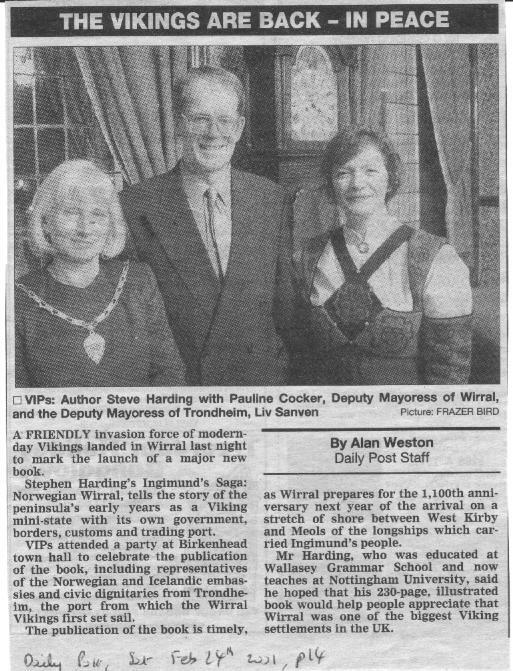 Heathen and Higgin, Letter by Steve Harding, and Ingimund's Saga, Letter by Anne Beer, Wirral Champion, November 2003, page 70. 6. The Brunanburgh Viking. Poulton Hall Gardens Magazine, April 2004, page 11. 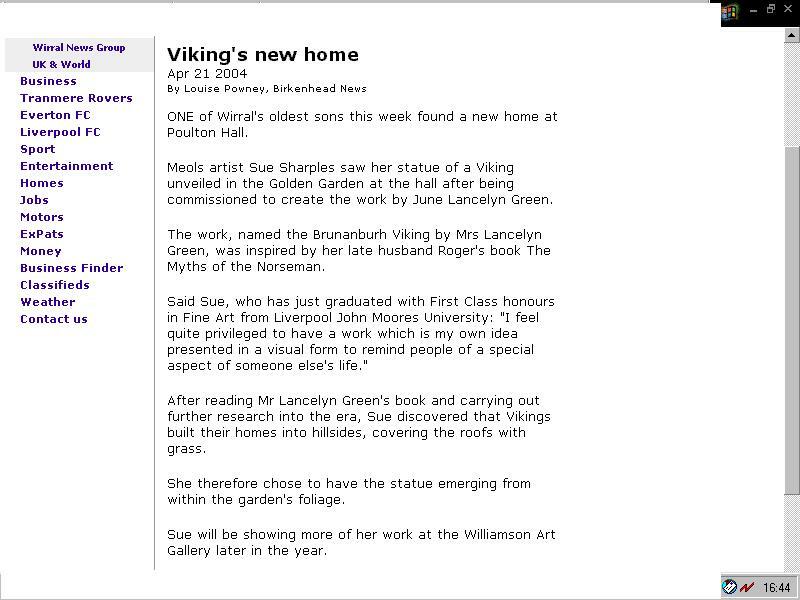 Article by June Lancelyn-Green on the unveiling of Sue Sharples Sculpture "The Brunanburgh Viking", 4th April 2004. 7. On the Net: The Vikings. BBC History Magazine, May, 2004, page 71. Chris Moss and Steve Harding review Viking web sites. 8. June Lancelyn Green's Dowagers Diary. Wirral Champion, August, 2004, pages 36,37. Article includes Sue Sharples' Brunanburgh Viking. 9. Viking Wirral and the Battle of Brunanburh. Battlefield, August, 2004, pages 22, 23. 10. Its all in a name. BBC History Magazine, January 2005, volume 6, no.1., page 61. 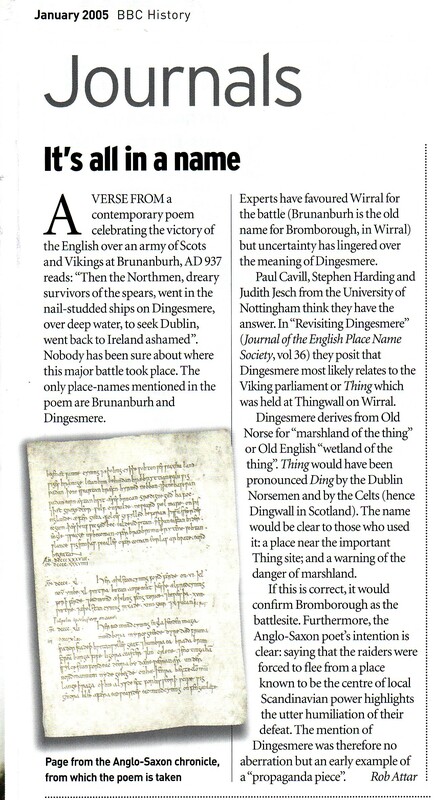 Article by Robin Attar in the Journals section, reviewing the recent publication in the Journal of the English Place Name Society about Dingesmere and the Battle of Brunanburh. 11. If you are looking for the Vikings - looking no further! Teaching and Learning Magazine, January/February 2006, page 64. Feature article by Juliet Smith on the forthcoming launch this year of the Web Resource 'Vikings in Wirral'. 12. Vikings nice blokes really, Times Education Supplement Magazine, 19 January 2007 pages 54-55. Launch of the highly acclaimed Web Resource ‘Vikings in Wirral’ by the Wirral Learning Grid, Steve Harding & Mike McCartney. 13. Scandinavian Invasion, Tranmere Rovers Official Programme (Tranmere v Chesterfield, 2nd March 2007), p21 &36. Article by Tony Coombes about Tranmere’s growing band of Scandinavian supporters. 14. Honour for Norwegian king. Oxford Today, Hilary Issue, 2007. page 4. Article about award of Degree of Doctor of Civil Law to King Harald V. Harald tells about the long line of Norwegian kings educated in England since Harald Haarfagre’s son Hakon the Good. You can download the King’s speech here. 15. Viking Time Travellers. Historic cross at Neston to be restored. Wirral Champion, October 2007. Article on the stone fragments belonging to 10th Century Viking crosses at Neston. 16. Anglo-Norse Review, Winter 2007, pages 27-30. Report on the rediscovery using Ground Penetrating Radar of an old buried clinker boat at Meols – and speculation as to what it might be. 17. A Viking ship at Meols? Current Archaeology, December 2007, volume 213, pages 4-5. Article by Lisa Westcott about an intriguing vessel buried under the Railway Inn car park, Meols. 18. The Viking Roots of North-west England. Current Archaeology, April 2008, volume 217, page 7. News item about the publication of the paper in Molecular Biology and Evolution. 19. Norways “colony” of Wirral, Liverpool. Appendix article in Torgrim Titlestad’s book Viking Norway, Saga Bok, Stavanger, 2008, pages 371-379. 20. Raiders or Traders? Smithsonian Magazine, July 2008, pages 26-30. 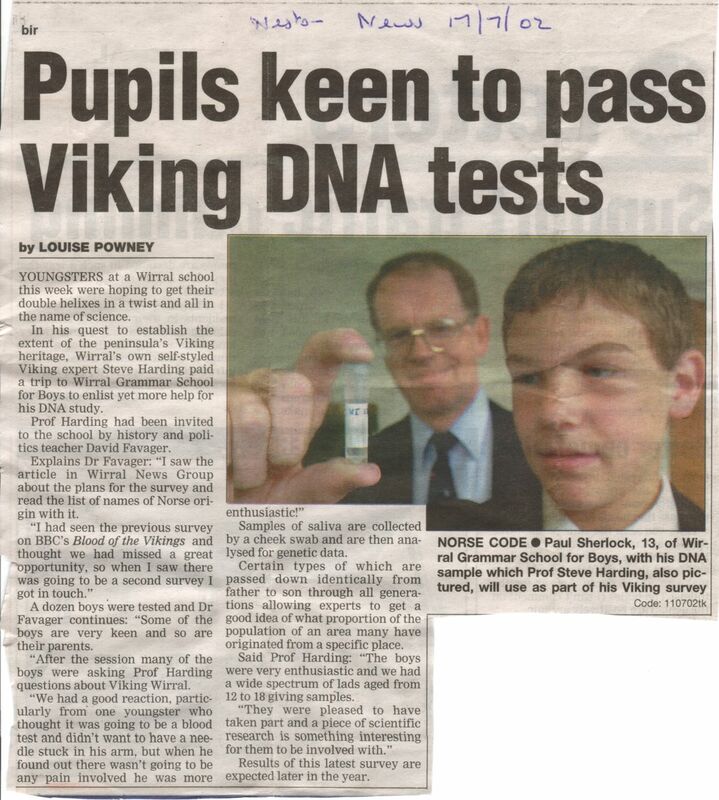 Article by Andrew Curry on the Vikings: including a section on page 29 about the genetic survey of North-west England. Web link. 21. Looking for Vikings in north-west England. Two articles in British Archaeology (Nov/Dec 2008, pages 18-25) by David Griffiths and by Steve Harding and Mark Jobling. Web link. 22. St. Olav’s Viking Walk. The Norseman, January 2009, pages 46-53. Article by Steve Harding and Dan Robinson on the Wirral-Chester “Olsok” Viking walk. 23. Viking Wirral and Viking Genes. Heswall Magazine, February 2010, pages 24-25. 24. Ny “Liverpool-bok” I salg: Vikingblod. November 2011. Artikkel i "Kopite" - for de 30 000 medlemmene av den skandinaviske støtter klubben av Liverpool FC - om ny bok av Steve og Stig om det skandinaviske påvirkninger fortid og nåtid i området rundt Liverpool - Wirral og West Lancashire - i Nordvest-England. [Article in the "Kopite" – for the 30000 members of the Scandinavian supporters club of Liverpool FC - about the new book by Steve and Stig about the Scandinavian influences past and present in the area around Liverpool - Wirral and West Lancashire - in north west England]. 25. Wirral Sets Sail. Cheshire Life, June 2012 pages 217-220. Article by Emma Mayoh. NB “King Alfred” should read “Queen Aethelflaed, daughter of King Alfred”. 26. **NEW** Vikings in the Wirral. From Tranmere Rovers to the Royal Palace. The Pembrokian, July 2012 volume 36 page 7. 27. In Search of Vikings. University experts in arts and sciences publish new book. University of Nottingham Web, January 29, 2015. Article by Emma Rayner. 28. Marking the spot of an Old Viking parliament. The News Room, University of Nottingham, March 6, 2015. Article by Emma Rayner. 29. Did the Vikings use crystal ‘sunstone’ to discover America? The Conversation, January 29 2016. Article by Steve Harding. 30. NEW: Viking seafarers may have navigated with legendary crystals. Science Magazine, April 3, 2018. Article by Sid Perkins. 31. NEW: The crystals that may have helped Vikings navigate northern seas. New York Times, April 6, 2018. Article by Steph Yin. 32. NEW: Why can't we figure out how the Vikings crossed the Atlantic? Atlas Obscura, April 27, 2018. Article by Jessica Leigh Hester. 15. Viking's New Home. Wirral News, 21st April 2004. Article by Louise Powney on Sue Sharples' Brunanburh Viking sculpture at Poulton Hall. 16. Discovery is rewriting our peninsula's history. Wirral Globe, 23rd June 2004, page 11. 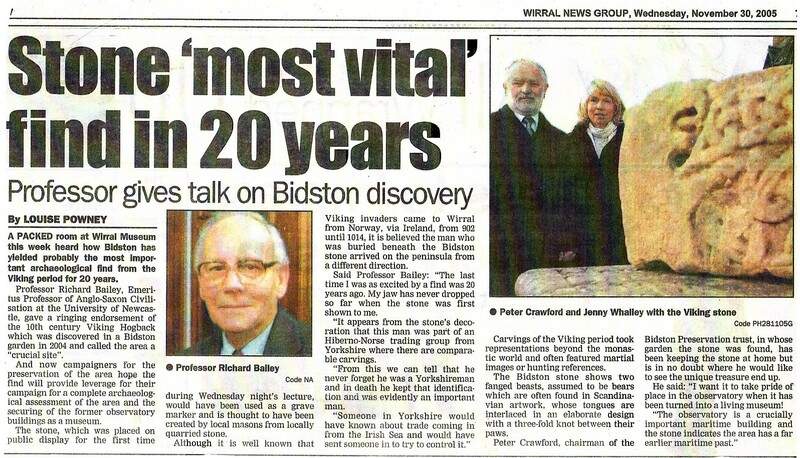 Article by Eric Munn on amazing discovery of Viking stonework at Bidston. 17. VIKINGS ARE RETURNING: Heritage of Norse invaders to be marked. Wirral News, 21st July 2004, Page 1 and Page 2. 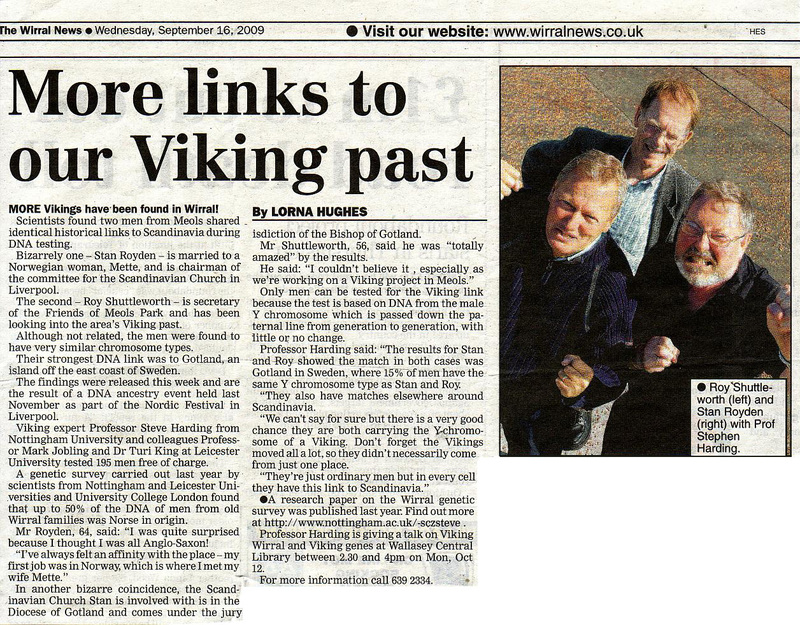 Article by Louise Powney on the Wirral Viking Heritage Project. 18. BATTLE COULD SPARK BOOM: Heath site of historic conflict. Wirral News, 13th October, 2004, pages 1-2. Article by Kevin Core on the solution of a mystery concerning the Battle of Brunanburh: “Dingesmere” as the “Thing’s mere or marr”. See also this video clip of marshland/wetland on the Dee estuary. 19. For the Cradle of English Civilisation, go to the Wirral. 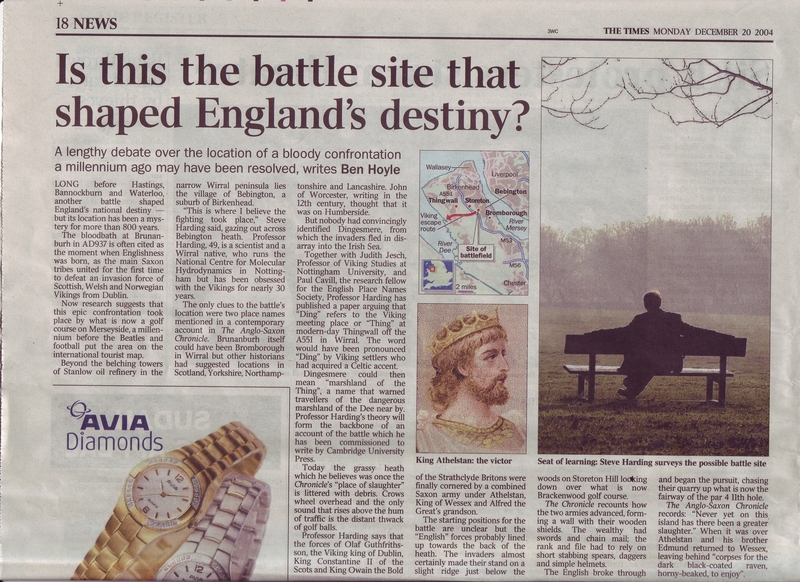 The Independent, 8th December 2004, page 15. Article by Louise Jury on the Battle of Brunanburh. 20. Is this the battle site that shaped England's destiny? The Times, 20th December 2004, page 18. Article by Ben Hoyle on the Battle of Brunanburh. 21. History Hot Topic! Wirral News, 10th August, 2005. Article by Louise Powney/ photo Val Curtis about the annual Viking boat burning at Thurstaston. 22. Rovers Fan on Rich-List. Wirral News, 16th November, 2005. 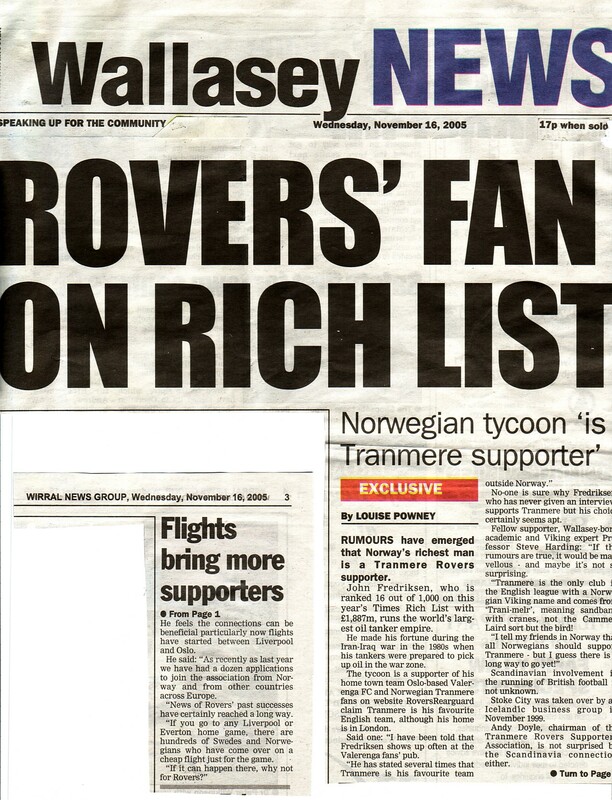 Article by Louise Powney on rumours from Norway that Shipping Magnate John Fredriksen is a Tranmere Rovers supporter. 23. Stone 'most vital' find in 20 years Wirral News, 30th November, 2005. Article by Louise Powney about a lecture given by Professor Richard Bailey on the discovery of the 'mini-hogback' tombstone at Bidston. 24. New bar mixes area's past with the present. Wirral News, 20th September, 2006, page 7. Article by Katy West on The Wro in West Kirby and an ancient Charter. 25. Viking Scholar asked the right questions. Wirral News, 10th January, 2007. 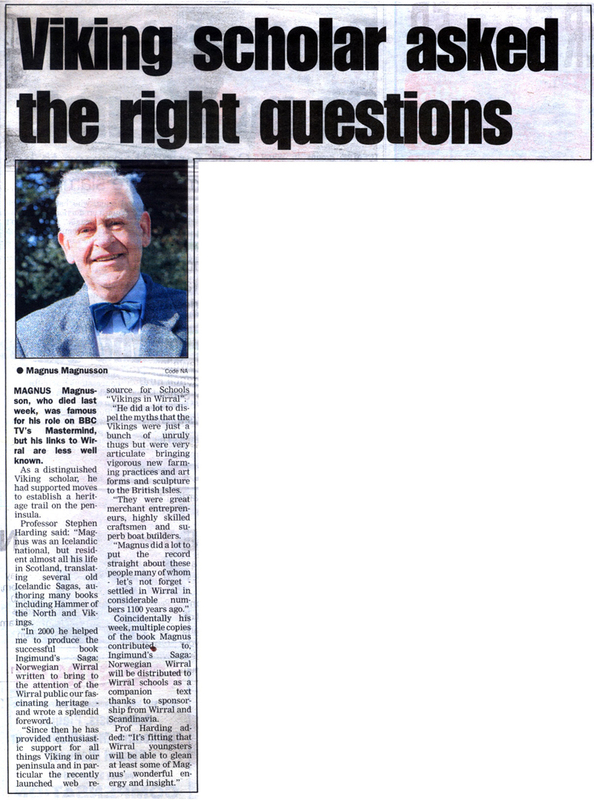 Wirral News’ tribute to Magnus Magnusson, who died on Sunday 7th January 2007. 26. Viking Support. Wirral Globe, 6th March, 2007. Article about the large numbers of Norwegians coming to Tranmere home games – and the historical connection with the Vikings. 27. Viking invaders are flocking to Tranmere. 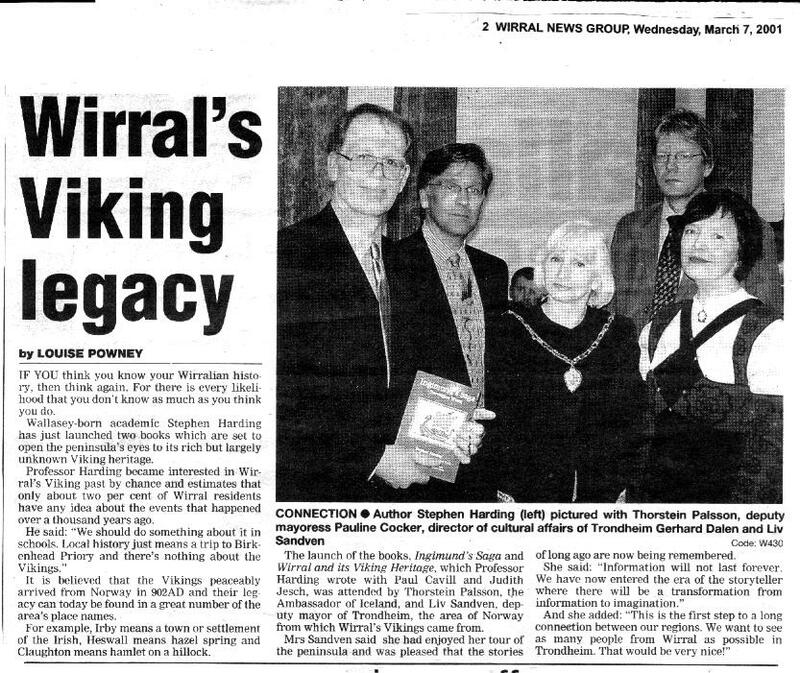 Wirral News, 7th March, 2007, page 6. 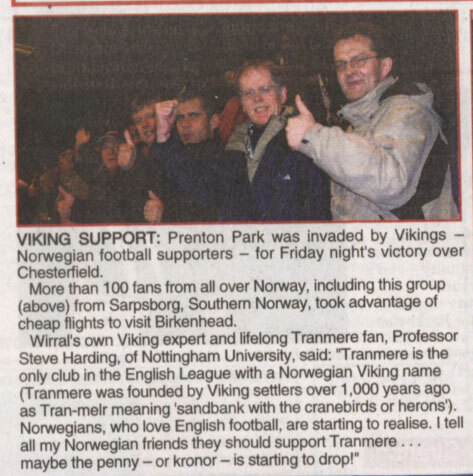 Article about over 100 Norwegian supporters now regularly coming to Tranmere’s Friday home games – and the historical connection with the Vikings. 28. Festival Celebrates our Viking Heritage. Wirral News, 27th June, 2007, page 11. Article by Katy West on visit by Wirral Cultural delegation Mike McCartney and Steve Harding to Iceland as guests of ICE2007 Festival organiser Ingi-Thor Jonsson and Icelandic Booker Prize winner Andri Snaer Magnason. 29. Heritage Walk. Wirral News, 25th July 2007. Article by Katy West on Wirral Viking Churches Heritage between St. Bridget’s West Kirby and St. Mary and St. Helen’s in Neston. 30. Town’s historic Viking cross to be restored. Ellesmere Port Standard, 22nd August, 2007. 31. Historic Find to be Rebuilt. Neston News, 22nd August, 2007, pages 1&2. Article by Matt Hurst on the stone fragments belonging to 10th Century Viking crosses at Neston. 32. Bold icon needed to announce borough. Wirral News, 29th August, 2007. Article by Sue McCann. Stephen Harding writes a statement in support of the M53 “Magic” Boat. Web link. 33. Builder found Vikings washed up at Pub. The Times, 10th September 2007, p. 29. Article by Jack Malvern on the rediscovery using Radar methods of an old clinkerboat which may date from the Viking settlements on Wirral. 34. Radar scans reveal Viking boat underneath a Pub. Independent, 10th September 2007, p9. Article by Ciar Byrne on the rediscovery using Radar methods of an old clinkerboat which may date from the Viking settlements on Wirral. 35. 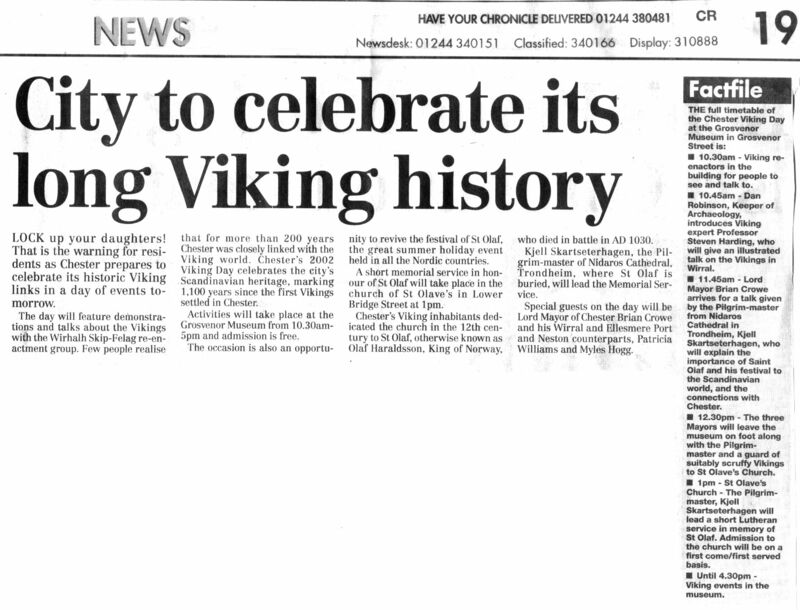 Natives are of Viking Stock, Ormskirk Champion, 3rd October 2007, pages 1 and 5. Article by Natasha Robson on the forthcoming publication and presentation of results at the David Lloyd Centre, Knowsley, 27 November 2007, 7pm. 36. Ligge det et vikingskip under denne puben? (Transl. Does there lie a Vikingship under this pub?). Dagbladet (Norway) 20th October 2007 pages 14 and 15. Ole Bjørner Loe Welde considers the evidence for a Nordic clinker boat under the Railway Inn Pub at Meols, on the Wirral peninsular near Liverpool. Direct web link from Dagbladet. See also: The Meols Boat Project. 37. 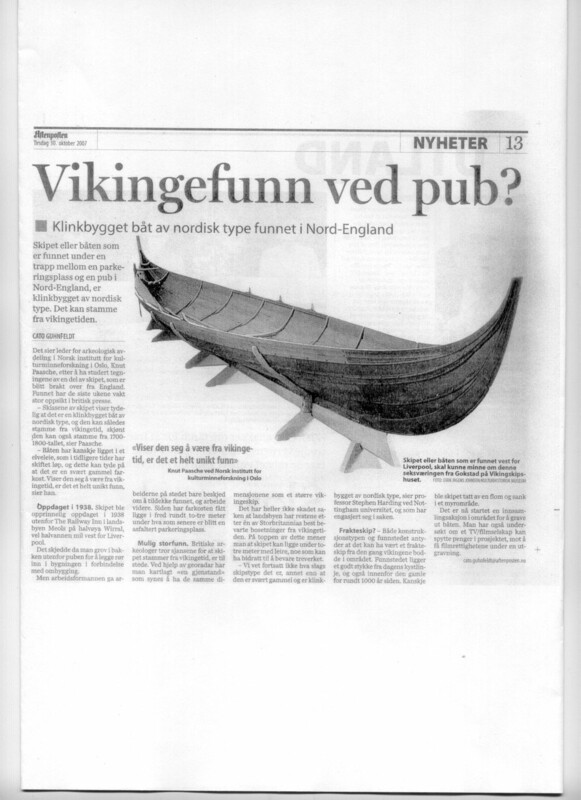 Vikingefunn ved pub? (Transl. Viking find at a pub?) Aftenposten (Norway) 30th October 2007 page 13. Article by Cato Guhnfeldt considering the evidence for a Nordic clinker boat. 38. Forensics tracking a Viking ancestry. Volunteers take a DNA voyage into the past. Wirral News, 31st October 2007 page 5. Article by Clifford Birchall on the forthcoming publication and presentation of results at the David Lloyd Centre, Knowsley, 27 November 2007, 7pm. 39. Viking links to be disclosed. Ormskirk Advertiser, 1st November 2007, page 29. Article by Clifford Birchall on the forthcoming publication and presentation of results at the David Lloyd Centre, Knowsley, 27 November 2007, 7pm. 40. Findings of Viking study expected soon. Midweek Advertiser, 7th November 2007, page 8. Article by Clifford Birchall on the forthcoming publication and presentation of results at the David Lloyd Centre, Knowsley, 27 November 2007, 7pm. 41. Forensics find Viking clues, Midweek Visitor, 7th November 2007, page 12. Article by Clifford Birchall on the forthcoming publication and presentation of results at the David Lloyd Centre, Knowsley, 27 November 2007, 7pm. 42. DNA’s the hi-tech way of digging up history of Vikings. Years of research about to be unveiled. Formby Times, 1st November 2007, page 36. Article by Clifford Birchall on the forthcoming publication and presentation of results at the David Lloyd Centre, Knowsley, 27 November 2007, 7pm. 43. Norse by north west. Liverpool Echo, 24th November 2007. Article by Martin Rigby on the forthcoming publication and presentation of results at the David Lloyd Centre, Knowsley, 27 November 2007. 44. Modern day Vikings. How experts are tracing descendants. Liverpool Echo, 1st December 2007. Article by Martin Rigby (follow up of #56) about the publication of the paper in Molecular Biology and Evolution and the presentation at Knowsley. 45. Proof of Liverpool’s Viking past. Guardian, 3rd December 2007, p4. Article by James Randerson (Science correspondent) about the forthcoming publication of the paper in Molecular Biology and Evolution. Web link and blog. 46. Focus on Link with the Vikings, 30th January 2008. Article by Sue McCann on the forthcoming St. Bridget’s Centre Appeal Lecture on 5th February. 47. Morgunbladid, 24th February 2008, pages 20-21. Innlent - greinar UPPRUNI Með víkingablóð í æðum Helmingur karla í Wirral og í Vestur-Lancashire afkomendur víkinganna. Article by Orri Pál Ormarsson about the publication of the paper in Molecular Biology and Evolution. 48. Morgunbladid, 6th June 2008, pages 1, 26 and 27. Víkingaborgin Liverpool. Sðgur, gen og tunumálið. 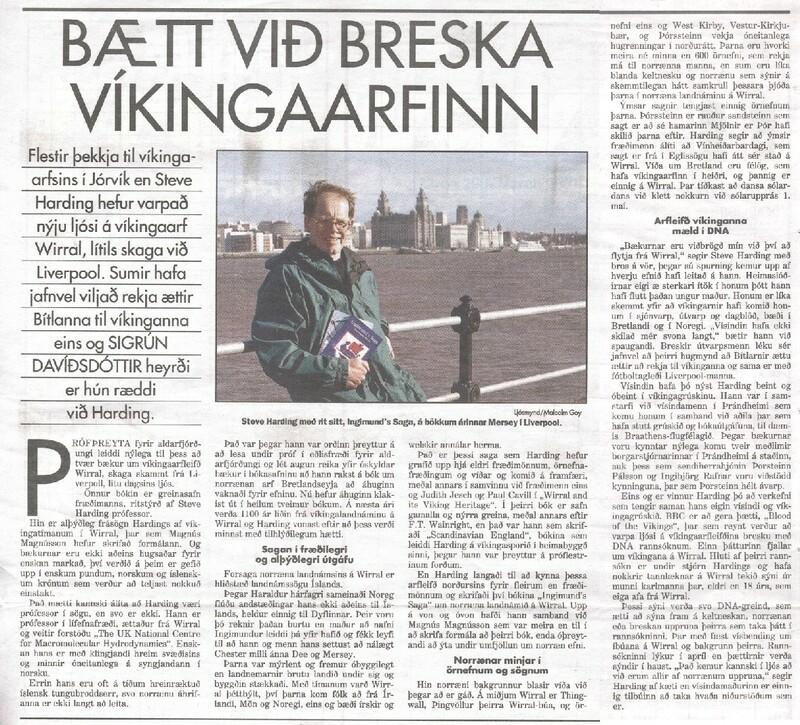 Article by Arnthor Helgason about the Viking links of old Liverpool, Wirral and West Lancashire. 49. Nordmenn skal testes for vikingblod, 28th September 2008. Article by Geir Lillesund (NTB) in Norways most popular paper about the search for volunteers from old families in specific areas of Norway. 50. Bergens Tidende, 28th September 2008. Sjekkes for vikingblod. Article by Geir Lillesund (NTB) (in Norwegian) on the search for volunteers from old families in the Bergen area of Norway. 51. Aftenposten (Norway), 29th September 2008: Article by Geir Lillesund (NTB) about the search for volunteers from old families in specific areas of Norway. 52. Adresseavisen (Norway), 29th September 2008: Søker vikingblod hos nordmenn. 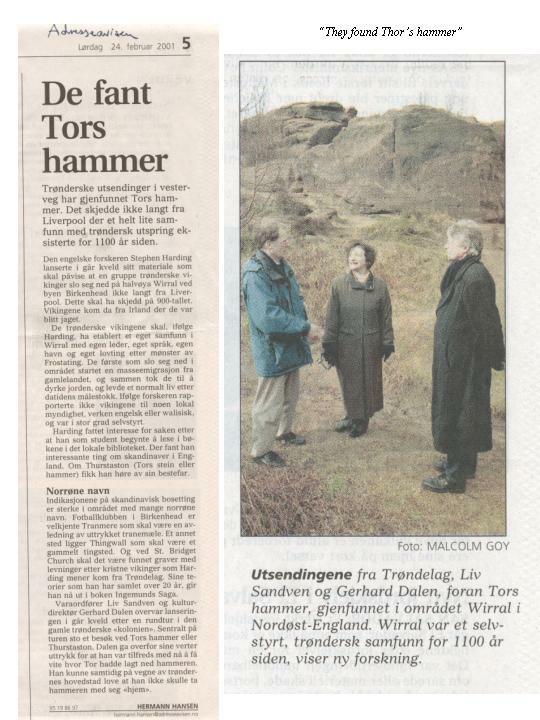 Article by Geir Lillesund (NTB) about the search for volunteers from old families in Trondelag. 53. Jyllands Posten (Denmark), 29th September 2008: Article by Geir Lillesund (NTB) about the search for volunteers from old families in the Jutland and Sjaelland areas of Denmark. 54. Gudbrandsdølen Dagningen, 2nd October 2008. Har du vikingblod I årene? De er på jakt etter frivillige i Gudbrandsdalene. Article by Ingunn Aagedal Schinstad on the search for volunteers from old families in the Gudbrandsdalen area of Norway. 55. Yorkshire Post, 30th January 2009. 'Time team' to seek out genetic secrets of Yorkshire's Viking past. Feature by Mark Branagan on the follow up of the Wirral & West Lancashire survey to the rest of northern England. 56. Wirral News, 25th March 2009, page 5. Unlocking secrets of our Norse code. Feature by Lorna Hughes on the link-up between Thingwall in Wirral and Tingvoll in Norway, focusing on the schools and a visit of a 12-strong delegation from Tingvoll. 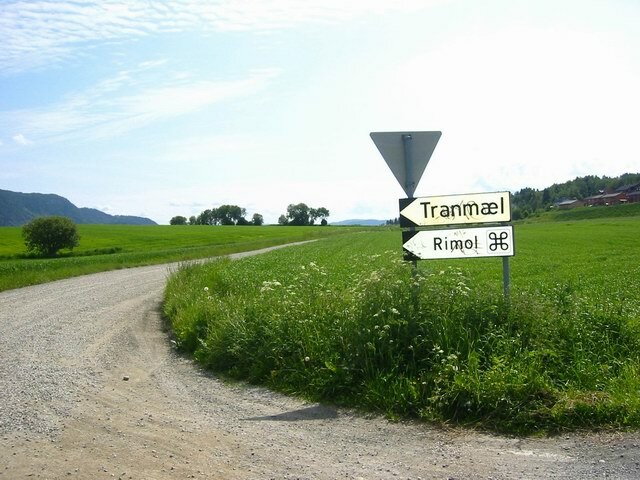 Read also this report (in Norwegian) by Gunnlaug Ribe from Tingvoll Kommune. 57. Wirral News, 8th April 2009, page 24. Short Sighted. Letter by David Griffiths, Steve Harding and Rob Philpott protesting about the threatened closure of Wirral Libraries. 58. Wirral News, 22nd April, 2009. Tranmere must mark Viking name. Letter by Steve Harding about the 125th anniversary of Tranmere Rovers. 59. Wirral News, 3rd June 2009. Cruel Vikings. Letter by Harry Smith (West Kirby). 60. Wirral News, 16th September 2009, page 7. More links to our Viking Past. Article by Lorna Hughes on Stan Royden and Roy Shuttleworth from Meols. Blog link. 61. Liverpool Echo, 5th May 2010. King of Norway visits Wirral. Feature by Liam Murphy on visit of the King to the Royal Liverpool Yacht Club. 62. Wirral News, 19th May 2010. On the trail of Viking history. Article by Lorna Hughes on the unveiling of an Information board at Meols Park by MP Esther McVey. 63. Haugesunds Avis & Karmøy Lokal, 10th June 2010. Jakter på viking-gen. Article by Carsten Kickstat on genetic survey of old Norway, and visit of Mark,Turi and Steve. Pdf of visit - starting off with Marilyn Monroe and finishing with a tricolor picture with Per Anders and Stig. 64. Day the Vikings made a comeback and Heritage walk starts from Neston church; Wirral News, 21st July 2010. Double page spread of articles by Lorna Hughes covering the Nation Archaeolical Day event at Bidston and looking forward to thb St. Olav Viking Pilgrimage. 65. 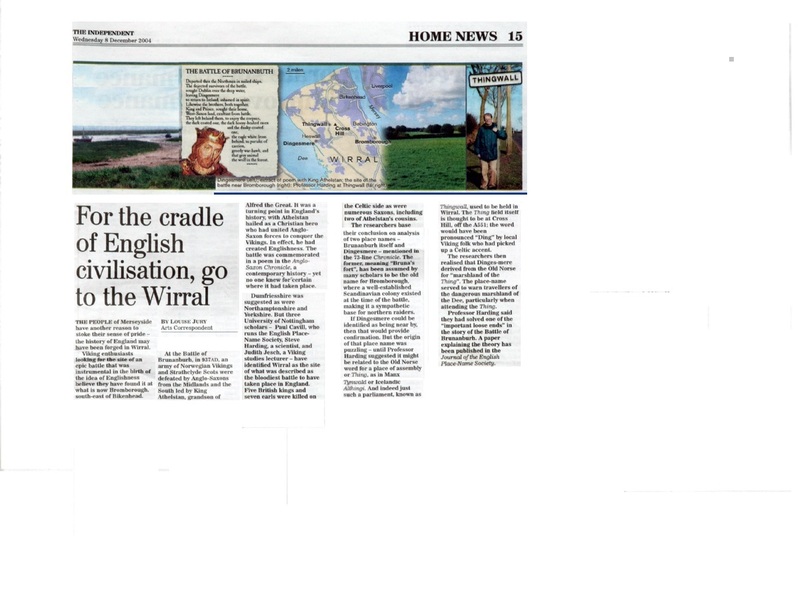 Pilgrimage is marking historical links and Vikings show how to live off the land: Wirral News, 4th August 2010. Articles by Lorna Hughes following the 2010 Wirral-Chester St. Olav Viking Pilgrimage. 66. Britain steeped in Viking blood: The Weekly News, Thursday 30th September 2010. A light hearted look by Craig Campbell about the legacy of the Vikings. 67. Viking Links Uncovered. Wirral News, 24th November 2010. Article by Lorna Hughes on the publication of the new Viking DNA book. 68. Viking coin is a forgery. Wirral News, 2nd March 2011, page 3. Article by Lorna Hughes on the discovery that a coin discovered in Neston in 2005 and attributed to the Viking King Olaf Guthfrithsson – is an elaborate fake. 69. Return of the Vikings: Rebuilt longboat to head for Wirral. Wirral News, 25th May 2011, page 3. Article by Lorna Hughes on the Drakken Harald Fairhair longship project..
70. Call to mark Viking Link to Thingwall. Wirral News, 5th October 2011, page 13. Article by Lorna Hughes on the proposal to replace the missing Thingwall sign at the bottom of Cross Hill with one similar to the Tingwall sign in Shetlands. 71. Ny bok om Viking-spor I England. Aftenposten, 4th December 2011. Article by Trine Andersen on the new book Vikingblod. Viking lecture in West Kirby raises £1329 for St Bridget’s Church appeal. Wirral News, 15th February 2012. Article by Lorna Hughes. AGM and Viking Talk. Wirral News, 22nd February 2012, p9. Wirral Viking Past brought to present. Wirral Globe, 22nd February 2012. Article by Craig Manning about the new signposts for Thingwall. Town Hall hosts Wirral Heritage Fair. Wirral Globe, 29th February 2012. The Vikings are Coming! .. or are they already here? Liverpool Echo, 18th June 2012 p9. Article by Linda Foo Guest on the official opening of the Thingwall signs by Esther McVey MP. Wirral Villages face up to Viking Past. Wirral Globe, 19th June 2012. Article by Geoff Barnes on the official opening of the Thingwall signs. Statue will celebrate Wirral’s Viking Heritage. Wirral Globe, 30th July 2012. Article by Geoff Barnes on plans to erect a statue at Meols Park of Wirral’s 1st Viking leader - holding an oar! Viking Longship bound for Wirral. Wirral Globe, 15th October 2012. Update by Geoff Barnes on the progress of the Draken Harald the Fairhair longship and news of the delayed voyage until 2014. Heave, Ho, off to Norway we row. Liverpool Echo, 12th June 2013, p12. Article by Lorna Hughes. Wirral’s ‘Viking Navy’ tames the Draken. Wirral Globe, 19th June 2013. Article by Geoff Barnes. Draken Harald Hårfagre visit to Wirral – latest 3rd June 2014 update. Liverpool Echo. Page 1 headline. Page 3 article. Draken Harald Hårfagre visit to Wirral – latest 3rd July 2014 update. Liverpool Echo. Page 10 article. St. Olav Wirral Viking Heritage Walk and Pilgrimage. Wirral News, 9th July 2014, page 23. Draken Harald Hårfagre visit to Wirral – latest 16th July 2014 update. Wirral Globe, page 2. Draken Harald Hårfagre visit to Wirral – latest 18th July 2014 update. Liverpool Echo. Page 6 article. Longship sets light on Merseyside’s Viking History. BBC News, 18th July. 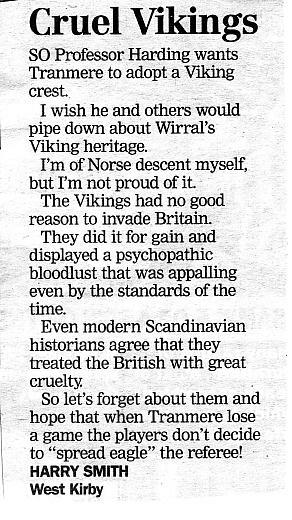 Feature on Vikings in Merseyside. Liverpool Echo, 22nd July. Page 10 article. Draken Harald Hårfagre visit to Wirral – latest 25th July 2014 update. Liverpool Echo. Page 1(Wirral extra) article. Draken Harald Hårfagre visit to Wirral – latest 1st August 2014 update. Liverpool Echo. Page 1(Wirral extra) article. Wirral says a fond farewell to world’s largest Viking longship. Wirral Globe, 5th August 2014. 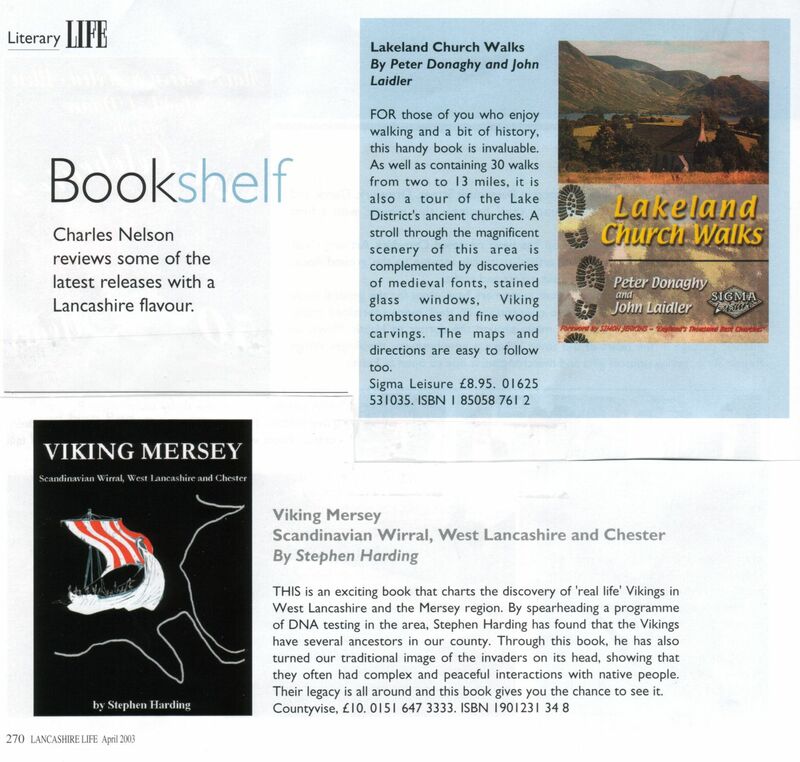 New book on Viking Tranmere – Liverpool Echo, 26th August, 2014. 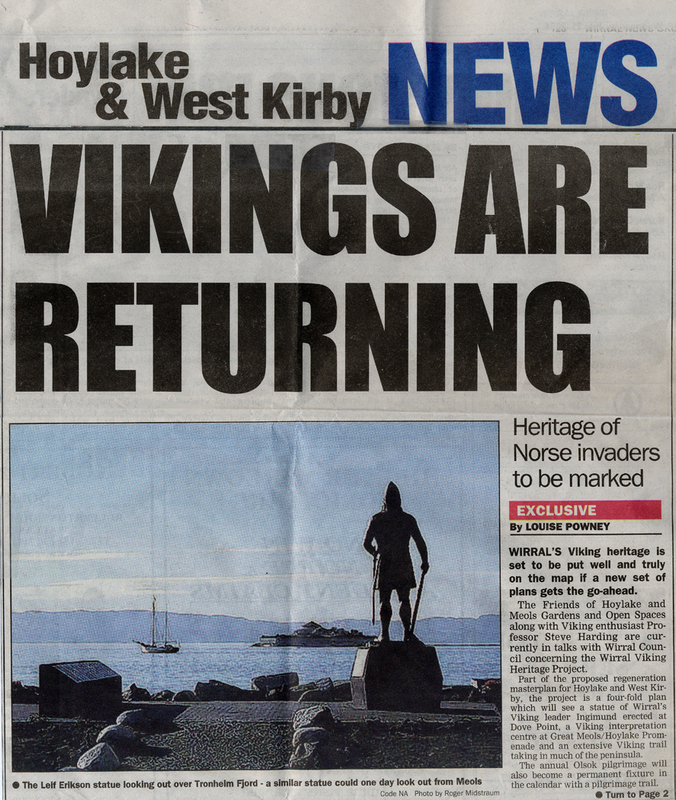 New book on Viking Tranmere – Wirral Globe, 27th August 2014. ‘Walk with the Vikings’ to celebrate city’s rich past. Chester Chronicle, 28th July 2016, page 5. ‘Upset at plans to redevelop Storeton Hall into luxury homes’ – Wirral Globe, 8th June 2017. Article by Lauren Jones. 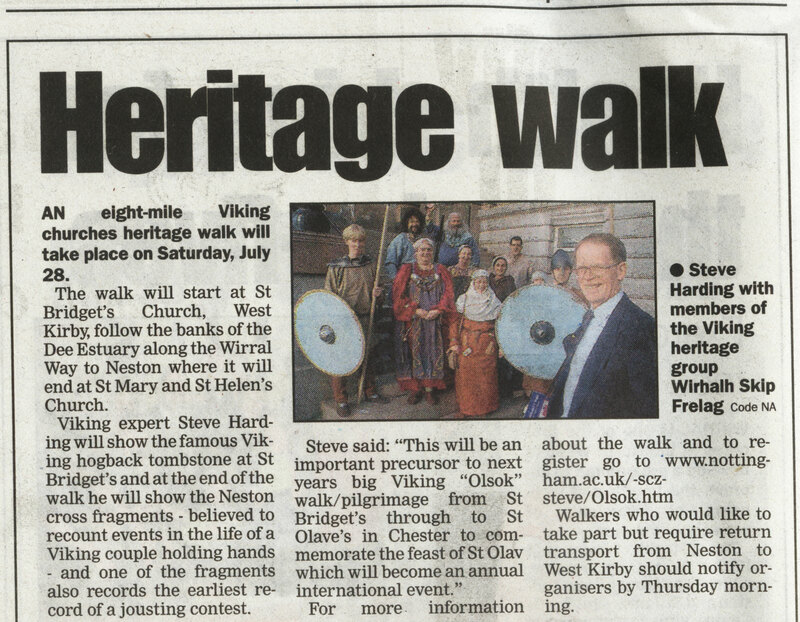 ‘Wirral Viking heritage walks return for 10th anniversary’ – Wirral Globe, 12th July 2017 page 12. Article by Lauren Jones. 1. Wednesday 17th January 2018. Hoylake Historical Society “Two Old Boats: their discovery and restoration”. Westbourne Hall, 7.30pm. 2. March 31st – July 7th 2018. Vikings: Rediscover the Legend. Atkinson, Southport. 3 month Viking Exhibition, including exhibits from West Lancashire. 4. Tuesday 23rd May 2018 1pm. “Viking DNA of Wirral and West Lancashire”. A fresh view on the successful Survey that took place between 2002 and 2010 based on men from old Wirral and West Lancashire families, and what it means today, particularly in the light of the Archaeological finds. The Atkinson, Southport. Admission £2. 5. Thursday 21st June, 7pm. “The Viking Settlement of the Sefton Coast” – talk by Paul Sherman, including the latest Archaeological finds. The Atkinson, Southport. 6. Monday 2nd July 2018 6.30pm “The Legends and Sagas of the Trolls of Scandinavia”. Wirral Libraries “Summer Trolls Season”. Bebington Central Library 6.30pm. Tickets £3. 7. Tuesday 10th July 2018. Tranmere Rovers versus Liverpool. Annual pre-season friendly at Prenton Park where Jurgen Klopp brings his 1st team. Now Tranmere are a Football League team again! 13500 attended last year, covered live on LFC TV. Buy Tickets. 8. Sunday 29th July 2018. St. Olav’s Viking Heritage Walk. 9. ***NEXT*** Tranmere Rovers – the only team in the English Football League with a Norwegian Viking Name, in action: Saturday 27th April 2019, “Viking Tranmere” – are home to Bury. Tranmere stadium (CH42 9PY) Kick off, 3pm. FANS IN SCANDINAVIA CAN WATCH THIS GAME LIVE ON I-FOLLOW: MATCH PASS 6 EUROS. You need to wait until ~15 minutes before the kick off before you can get your pass. For those in UK nearest rail stations (20 min walk – Birkenhead Central; Rock Ferry). Woodside Ferry 30 min walk or catch regular bus to stadium from terminal, and it’s a 30 minute drive from Manchester airport (M56 & M53 – leave at junction 4, 4th exit). Then: Tuesday 2nd April , Crawley vs Tranmere 3pm : For Viking fans outside the UK the game can be watched live on I-FOLLOW: the club charge only 6 Euros: you can also buy a whole seasons match pass. For Norsemen inside the UK only selected games can be viewed, we will let you know when they are due! – email Steve Harding if you are having difficulty. Tranmere stadium has a fantastic atmosphere with many Scandinavian supporters. Games now regularly attract 8-10,000 – click to capture the atmosphere in a recent win vs MK Dons! . The survey supported by the U.K. Biotechnology and Biological Sciences Research Council under the prestigious Watson-Crick 50th Anniversary programme was commenced in 2002 by researchers from the Universities of Leicester and Nottingham and has now been completed. The synopsis for the project was as follows: "If Vikings invaded and settled particular regions of the British Isles, we may be able to see their legacy within the DNA of modern populations of these regions. The male-specific Y chromosome is more likely to have preserved the signal of Viking presence than other parts of our DNA. In this project we extend the BBC's 'Blood of the Vikings' study in the Wirral and SW & West Lancs region, where Viking settlement is known to have been substantial, but where modern population influx has also been great. We plan to analyse the Y chromosomes of men from these regions who also have surnames known to have been present their in mediaeval times, and thus to bypass the recent major population movements in the region that may disturb the relationships between old genes and modern geography". The results from the project were published in 2008 in the leading scientific journal Molecular Biology and Evolution (Oxford University Press). It can be downloaded from here as an open access article. 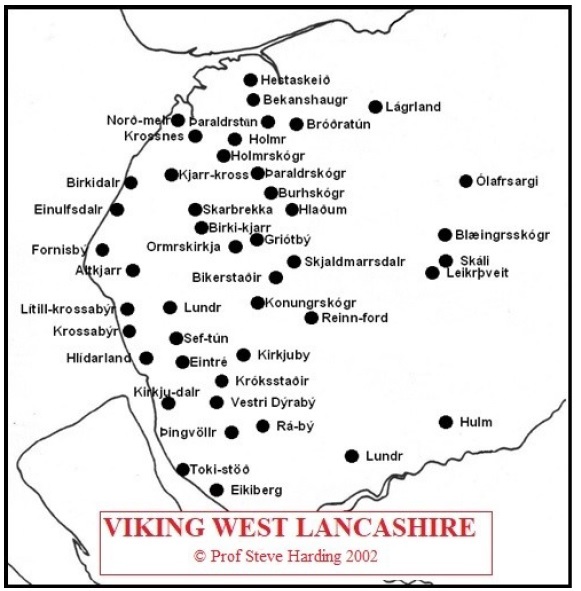 A more general publication “Viking DNA: The Wirral and West Lancashire Project” was subsequently CRC Press. For more details about the background behind the project click here. Annual informal walk by a group of enthusiasts from St. Bridget’s Church in West Kirby, along the Wirral Way to St. Mary & St. Helen in Neston (arrive approx. 1.30pm) celebrating Wirral’s Viking heritage. After refreshment provided by the Church of St. Mary and St. Helen, enthusiasts can if they wish move by train to Chester and complete the walk to St Olave’s Church. In common with the main St. Olav walks in Norway, all walkers come at their own risk, and are strongly advised to bring water and some refreshment for the route. No charge, but enthusiasts will be expected to pay for their own train fare back from Neston (or Chester) to West Kirby. Those wishing to participate please contact Steve.Harding@nottingham.ac.uk and go to this web page St Olavs Day Walk web page (this is annually updated). The background behind it is described in The Norseman magazine. Many people have enjoyed the envigoration of this “mini” pilgrimage with Christian-Viking roots, including BBC Television’s Michael Wood, who joined us in 2011. Stein Thue, in his book The Pilgrim Way writes the following: “When we now encourage people to walk the pilgrim ways it is to reap the benefits of outdoor life, special cultural experiences and personal reflection. The pilgrim dares to leave behind everything that is near and dear and wander into a new landscape, where he becomes a peregrine, a wanderer from far away. In the middle ages he would break from everything around him to express his devotion, seek healing, or do penance. Today a pilgrim seeks knowledge, recreation and self-fulfilment in such a way that perhaps the path is more important than the goal. The pilgrim understands that there is a path he must travel and that there is risk in the endeavour. The benefits nevertheless outweigh the risk for those who dare embark on such and adventure, as on their return from their fulfilling wandering, they will shed at least one prejudice and replace it with at least one new idea”. . We would like to stress that in common with the main St. Olav’s pilgrimage in Norway which occurs on the same day, please note that all walkers/pilgrims do so at their own risk. The organisers merely provide a guide. Viking 1100th Anniversary Services at St. Olave’s . To celebrate the 1100th (or approximately 1100th) anniversary of the arrival of Vikings into the area, in 2001 and 2002 re-enactments of the arrival of Ingimund and some “local skirmishes” were performed at Arrowe Park Wirral followed by “Olsok” services at St. Olave's Church in Chester. The 2001 service was led by Pastor Oddgeir Bolstad (of the Scandinavian Church, Park Lane Liverpool). The 2002 service was led by Pastor Kjell Skartseterhagen, the St. Olav Pilgrimprest (Pilgrim Priest) from Trondheim. Unfortunately the church is not in a state at the moment to do this again! But view these clips from 2001 and 2002. St.Olave’s Service, August 2001 with Pastor Oddgeir Bolstad (approx 4min) and St.Olave’s Service, August 2002 with Pastor Kjell Skartseterhagen (approx 3min). There are many other sites on Wirral of relevance to its Viking Heritage and I’ve mapped out a proposal for a potential trail: this is simply my suggestion, and some of the sites marked are currently accessible – some are currently not. For details see here. In 2007 ground penetrating radar experiments appear to have confirmed the existence of an old clinker built boat deep under a pub car park at Meols. The boat had been discovered by workers digging foundations in the 1930’s and, after one of the workers had made a sketch of the end of the boat that was exposed, was covered over again. An unpublished study made in 2007 using Ground Penetrating Radar seem to suggest the vessel is still there. A hypothesis or suggestion has been made that it may possibly date back to the Viking age: the boat is of clinker design (overlapping planks) although it appears to have a rounded end. Until the boat is dated, all we can say for sure is that it is very old! Download a transcript of a seminar given at the North Sea Conference at Gothenburg Museum, October 14th 2011. Presentations: Introduction: Professor Stephen Harding; What’s in a name? The genetic legacy of the Vikings in the north of England: Dr. Turi King; Taking sides: North West Vikings at the battle of Tettenhall in 910: John Quanrud; The Dee/ Mersey Basin and the Archaeology of the Irish Sea Region: Dr. David Griffiths; The historic background to Viking settlement in the North West: Dr. Clare Downham; The Battle of Brunanburh: Dr. Paul Cavill; The Neston Cross reconstruction: an exercise in community engagement: Dr. Roger White; Viking-age rural settlement in Wirral: Dr. Rob Philpott; Viking Age Women: Dr. Christina Lee; Book Launch introductions: David Griffiths, Steve Harding and Rob Philpott. If you wish to watch an on-line video of one of the above talks please click here and email us. Karmøy, Norway, June 2013: “Taming the Draken”. 50 men and women from Wirral & the East Midlands – trained principally by Liverpool Victoria Rowing Club – were given the opportunity to row the Draken Harald Hårfagre at the Karmoy Viking Festival, thanks to he generous support of Norwegian Businessman and Viking Enthusiast, Sigurd Aase. The vessel sailed to Wirral July 2014, arriving in Wallasey Pool – an awesome spectacle – finally returning – after having a new mast - August 3rd: It is hoped the 35 metre vessel will return in 2018, with 100 willing and trained rowing volunteers ready for action. A web resource for Wirral Schools is also available produced by the Wirral Learning Grid. It is targeted for Key Stage 2/3 as part of the National Curriculum. Magnus was one of the country’s leading television presenters, a well-known Viking Scholar and a good friend of the region. We said goodbye with this tribute to Magnus on BBC Radio Merseyside, 11.40am, 8th January 2007. Watch also this tribute to Magnus, 7.30pm, 5th February 2007. The Battle of Brunanburh was one of the most defining battles in the history of the British Isles and, as described by BBC Broadcaster Neil Oliver in History of Scotland it determined whether Britain would become one imperial power or stay as separate identities. Although the Northern Alliance of Scots, Strathclyde British and Norsemen from Ireland lost the battle against a combined Anglo-Saxon army from Mercia and Wessex - with heavy losses on both sides - the strong resistance proved decisive in what was to follow. The Battle of Brunanburh is recorded as a contemporary (or near contemporary) poem in the Anglo Saxon Chronicle, and almost certainly took place on Wirral. Compelling arguments had earlier been made for other locations, notably in Lancashire, Yorkshire, Lincolnshire, Northants and SW Scotland. However the weight of scholarly opinion seems to be heavily in favour of Wirral… and internationally respected author Bernard Cornwell agrees and has recently come out strongly in favour of Wirral in his latest novel: The Empty Throne. The Wirral peninsula and Chester had not long earlier witnessed another major battle between “the armies of the Norsemen and the Danes” and the Mercian English – AD907. Chester was also the place where the Anglo Saxons had one of their earlier crushing and most significant victories against the British - AD613. Brunanburh was the old name until about 1732 for Bromborough. The poem also gives the location of the coastal point of escape as Dingesmere – which has now been satisfactorily explained as the “Things – mere or – marr”, the wetland or marshland associated with the Thing – the Viking parliament, at Thingwall on Wirral. You can read more about Wirral’s link with the Battle of Brunanburh by following this link here …..
1. Pushing Back The Tide? Many people in North Wirral used to believe that the famous event where King Canute is alleged to have attempted to push back the tide took place between Meols and Moreton shore. This tradition – which went back generations - may have been inspired by the constant flooding of the area before the sea defences were built coupled with romanticism of the Victorians. Indeed, and apparently as a bit of fun a special “Canute Chair” was constructed by the Cust family of Leasowe Castle with the inscription “sea not come hither and wet the soles of my feet” but was sadly broken up in the 1950’s. Maybe there is a chance of another construction, but in the meantime, see my attempt to push the tide back in this clip (Vikings didn’t have horns on helmets by the way!). Magnus Magnusson also has a go on the banks of the Thames (I think) in this clip. 1. a stew made from leftover meat. This is a shortened form of "lobscouse" and the dish is very similar to "lapskaus" in Norway. Variations include “labskovs” in Denmark, lobskows in Anglesey, lapskojs in Sweden and labskaus in Northern Germany. A comparison of the two is given included in our new book Vikingblod (in Norwegian); 2. the accent/dialect spoken by a person from Liverpool. The precise origin of the word is uncertain and the subject of current research. You can buy some of the Danish stuff here. Highly acclaimed Schools Web Resource (see Times Education Supplement feature) set up by the Wirral Learning Grid in conjunction with Steve Harding and Mike McCartney. I would like to thank friends and colleagues at the Wirhalh Skip-Felag, BBC Radio Merseyside, BBC Radio Lancashire, BBC North West Tonight (particularly Jim Clarke), BBC Inside Out series (Laurence Innwood, producer), Trinity Mirror Copyright, the Wirral News Group, the Wirral Globe, the Wirral Champion, the Wirral Journal, Cheshire Life, Morgunblaðið, Nytt fra Norge, British Archaeology, Journal of the Chester Archaeological Society, Cheshire History, Wirral Life/ Chester Chronicle, Trine Andersen (NTB), Phil Hirst (Planet X TV), Chris Bartley and Sigrun Davidsdottir and Chris Collingwood for allowing me to reproduce or link to their material. I would also like to thank Wirral Archaeology for making me an Honorary Member (January 2019).